Today I gave my illustrated talk at the impact8 International Printmaking Conference, Borders and Crossing: the artist as explorer. The conference was held at the University of Dundee's Duncan of Jordanstone College of Art and Design in Scotland. My talk referred to my essay, Print Media Coupon as Artifact, and was presented within the Archives and Collections session. I shared the session time with Jo Stockham, an artist and professor of printmaking at Royal College of Art (RCA) in London. Jo's illustrated talk, No Map No Body, referenced her own art practice, along with her role as the head of the Printmaking Program at RCA with "opening up" the definitions of print practice to include printed ephemera and conceptual practice with information. She also shared her students work of cross disciplinary practice with industrial histories, commerce, and politics. Visit Chisenhale Studios to learn more about Jo Stockham art practice. Visit the impact8 website about other events and exhibitions at the conference and more information on the inaugural Print Festival Scotland. Below is my abstract for my illustrated talk. The print media coupon will be identified as an artifact by referring to Carrie’s coupon collecting cycle. 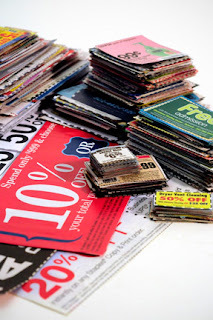 The process of the cycle will introduce the concept of the Coupon Collection, organization of a month’s accumulation of coupons, social medias role in presenting the collection, and a restaging site of the Coupon Collection. 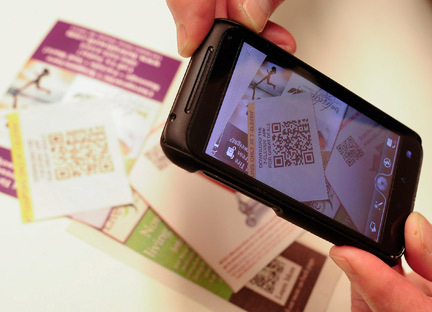 The Coupon Collection was started, because of a noticed visual change in the print media coupon form to a QR Code. Marshall McLuhan’s technical forms of communication will be referenced to how participants shape information with print media and digital media. Carrie’s process of collecting and forming a collection with the coupon contributes to the continual analysis of the print media culture’s transition. The print media coupons are grouped by the month of expiration, which presents a temporary time period for the print objects use in the social interaction of the trade process. Anthropologists, Alexander A. Bauer and Anna S. Agbe-Davis’ theory of rethinking trade as a social activity instead of on purely economic terms will be used to examine the role of the coupon in the social interaction of trade. There are two forms of public access to the Coupon Collection. They are an internet presence and opportunities to exhibit at public institutions. A webpage represents the collections acquisitions from a continually evolving collecting process from the American public domain. By employing other forms of social media the public has the option of following the collection and the current research. Carrie’s coupon collecting cycle forms a grouping of artifacts by their expiration dates, determining a temporary time frame of social interaction between person and the trade process. The use of material culture methods in Carrie’s contemporary art practice acknowledges the transition of the social and cultural interactions of contemporary objects.